The Foretrex 401 is a slim wrist-mounted GPS navigator perfect for outdoor activities that require the use of both hands. Foretrex 401 combines a high-sensitivity waterproof GPS receiver, electronic compass and barometric altimeter into a lightweight device ideal for hikers, skiers, campers and military personnel. To share data easily, you can connect Foretrex to your computer with USB or just send data wirelessly to another device. No matter where your adventure takes you, you’ll never worry about getting lost with the Foretrex 401. Foretrex keeps track of your path and displays it as a dotted trail on the screen. Just turn on Foretrex’s TracBack feature, and you can retrace your path back to where you started. Keep track of your bearing and altitude with Foretrex 401′s electronic compass and barometric altimeter. You can save locations in memory as waypoints, so you can always find your way back to any important place, like your campsite or vehicle. And with up to 17 hours of battery life and replaceable AAA batteries, you’ll never worry about making it back. Foretrex 401 lets you create and store routes to all of your favorite places and provides other helpful information, including a trip computer, sunrise/sunset times and hunting and fishing information. For even more data, connect Foretrex 401 to a wireless accessory, such as a heart rate monitor, cadence sensor, or clip it on your bike with the accessory bike mount. To keep track of your trip, connect your Foretrex to your PC or Mac with USB to store your waypoints, routes and tracks on your computer. You can also share waypoints, routes and tracks wirelessly with another Foretrex 401. Foretrex 401: Simple navigation that’s always on hand. What’s Included In The Box? 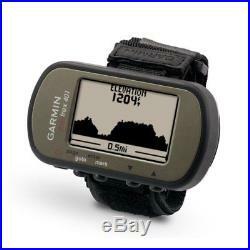 The Garmin Foretrex 401 ships with the following items included. Owners Manual on Disk. Unit dimensions, WxHxD: 2.9″ x 1.7″ x 0.9 (7.5 x 4.3 x 2.3 cm). Display size, WxH: 1.4″ x 0.9″ (3.6 x 2.3 cm). Display resolution, WxH: 100 x 64 pixels. Display type: Black and white LCD. Weight: 3.1 oz (87.3 g) with batteries. Battery: 2 AAA batteries (not included). Battery life: 17 hours. RoHS version available: yes. Ability to add maps: no. Accepts data cards: no. Track log: 10,000 points, 10 saved tracks. Automatic routing (turn by turn routing on roads): no. Outdoor GPS games: no. Sun and moon information: yes. Custom POIs (ability to add additional points of interest): no. Unit-to-unit transfer (shares data wirelessly with similar units): yes. 2.9in x 1.7in x 0.9in (7.5 x 4.3 x 2.3 cm). 1.4 x 0.92 inches (3.6 x 2.3 cm). 100 x 64 Pixels. Black and white LCD. 3.1 oz (87.3 g with batteries). 2 AAA (not included). Ability to add maps. Bluechart g2 Map Compatible. Bluechart g2 Vision Map Compatible. Turn right in 500 ft. Speaks street names e. Turn right ON ELM STREET in 500 ft. Speech recognition (navigate with voice commands). Automatic routing (turn by turn routing on roads). Auto sort multiple destinations (provides most direct route). Auto re-route (fast off-route and detour recalculation). Choice of route setup (faster time, shorter distance, off road). Route avoidance avoid highways, tolls etc. Custom POIs (ability to add additional points of interest). Hands-free calling with Bluetooth® wireless technology. XM® Navtraffic (includes basic weather) & Radio for U. MSN® Direct for U. Feature (find closest hospitals, police & gas stations, nearest address & intersection). Car locator feature (marks position when removed from windshield mount). Configurable vehicle icons (select car-shaped icons for map navigation). World travel clock, currency & measurement converter, calculator. Qwerty or ABC keyboard (choose keyboard layout). Garmin Lock (anti-theft feature). 10,000 points, 10 saved tracks. Sun and moon information. Unit-to-unit transfer (shares data wirelessly with similar units). 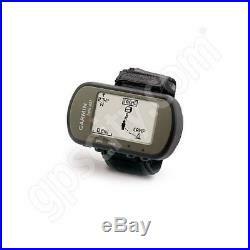 Heart rate monitor compatible. Bike speed/cadence sensor compatible. Supports AIS (tracks target ships’ position). Supports DSC (displays position data from DSC capable VHF radio). XM WX Weather & Radio for U. The item “Garmin Foretrex 401 Waterproof Hiking GPS System Compass and Alt 010-00777-00″ is in sale since Monday, November 19, 2018. 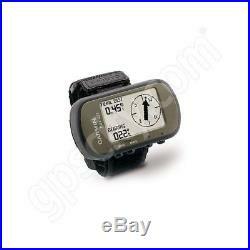 This item is in the category “Sporting Goods\Outdoor Sports\Camping & Hiking\Hiking Gear\Compasses & GPS”. The seller is “gpscity” and is located in Las Vegas, Nevada. This item can be shipped worldwide.